Unsuspecting commuters were given a stunning show this morning as a sensational acrobatic duo showed off their gymnastic flair and flexibility in several commuter hotspots in Central London and on the Underground. The team of elite gymnasts wow-ed passers-by as they showed off their skills in a variety of athletic and daring moves. They were spotted tumbling down a tube carriage in Charing Cross, vaulting benches in parks, back-flipping down Oxford Street and somersaulting on the South Bank. Commuters travelling to work were left in awe while watching the acrobatic spectacle. The gymnastic commuters were unleashed as part of a marketing stunt from Nutri-Grain to celebrate the launch of their new Nutri-Grain bars, which are made with six B vitamins and iron, known to help release energy from the food we eat and keep us fueled throughout the day. The acrobats were commissioned on the back of new research from Nutri-Grain, which reveals that nine in ten Brits (89 per cent) experience a slump in energy levels by mid-morning, 92 per cent find themselves craving a pick-me-up snack by mid-morning and one third of Brits (33 per cent) regularly skip breakfast. The phenomenal performance came from London-based acrobats Benjamin Jones and Abigail Mason, who together are trained in gymnastics, dance, contortion and martial arts, among other disciplines. The team are part of Nutri-Grain’s ‘morning fuel’ ambassador sampling team who are shaking up the morning commute in London this week appearing at train stations across the city. After witnessing the incredible display, commuters were treated to a Nutri-Grain bar, which are available in three flavours: Apple, Strawberry and Blueberry. Commuters were treated to an acrobatic performance by professional acrobats in London in a campaign by Nutri-Grain to launch a new recipe for Nutri-Grain bars, designed to fuel busy mornings. Issue date: Tuesday November 20th, 2018. Nutri-Grain research reveals 89% of Brits experience an energy slump by mid-morning. 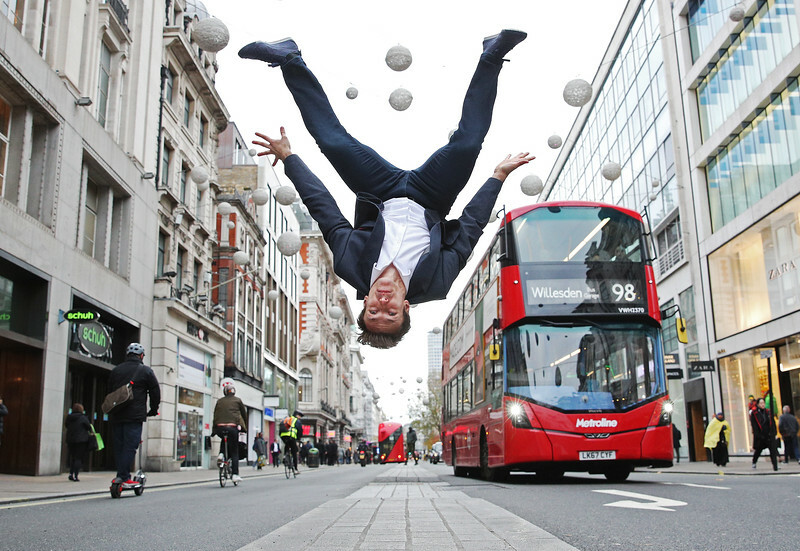 Gymnast Benjamin Jones performs a back somersault in Oxford Circus.